I've realized recently that I don't have very much breakfast content on my site. It's probably because I don't make a hot breakfast very often. During the week, I eat cereal, fruit and coffee to get out the door as quickly as possible. Often on weekends, we do pretty much the same thing. That's why homemade granola is perfect for us. It's a way to have something special and homemade for a weekend breakfast that doesn't require--in that moment at least--any preparation. It's easy to make and can be done way in advance. It should keep in the refrigerator for at least a week. 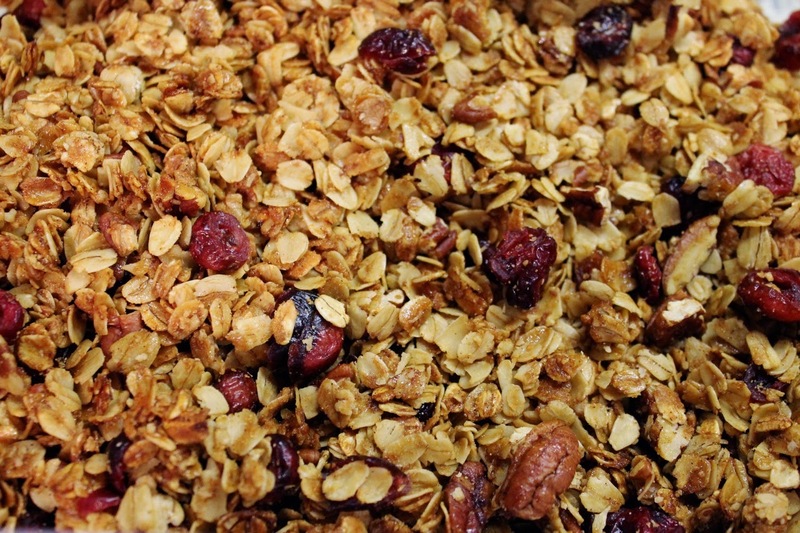 A coworker brought some homemade granola to the office for an informal breakfast get-together and shared with me how easy it is to make. I don't often buy granola at the store, as it's kind of expensive and you blow through the box quickly. 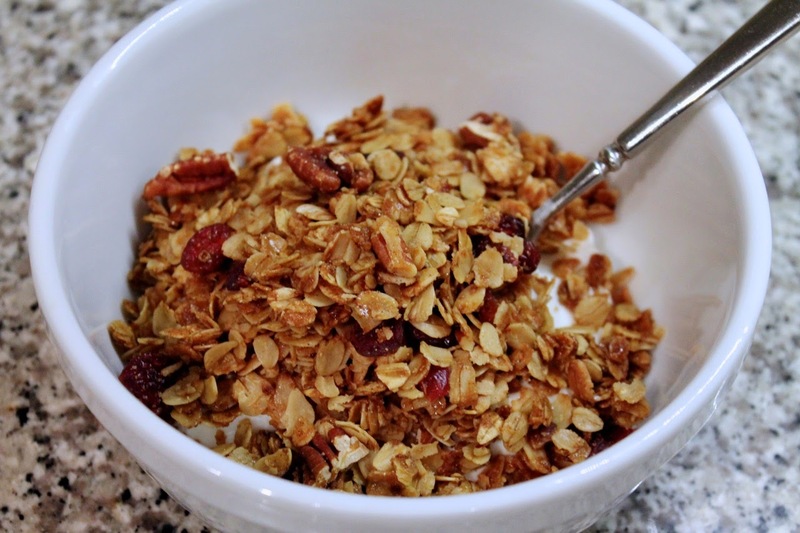 Homemade granola doesn't require expensive ingredients--the most costly thing is the pecans and you can certainly use other nuts, seeds or omit them. 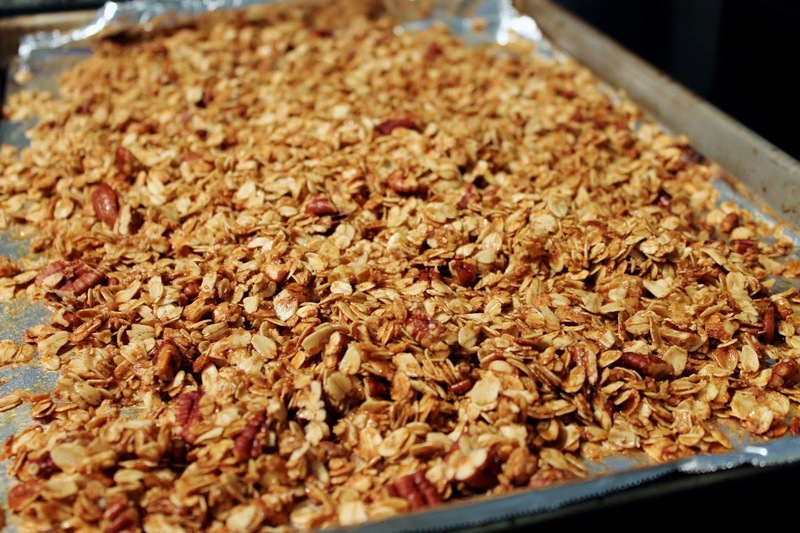 Granola is basically just roasted oats with a sweet glaze. You can put whatever else you want in it: spices, such as cinnamon or nutmeg; nuts, like almonds, walnuts or cashews; any type of dried fruit; coconut; etc. My coworker told me he used equal amounts of olive oil, brown sugar and honey, so I went with that in this recipe, along with a little cinnamon, vanilla, pecans and dried cranberries. Since toasted nuts are wonderful, I added the pecans with the oats, but the dried cranberries should be stirred in after roasting. I tried this with both Greek yogurt and milk and liked it both ways. It's definitely a more exciting way to start the weekend than a bowl of store-bought cereal. 2. Combine oats, nuts, salt, cinnamon, vanilla, olive oil, brown sugar and honey in a large bowl, stirring to evenly coat the ingredients with honey and oil. Spread mixture in an even layer on a rimmed baking sheet. Bake in the oven until browned, about 20-25 minutes. Set aside to cool. Transfer to a container, breaking up clumps (if desired). Stir in the dried cranberries. 3. Serve in bowls with milk or Greek yogurt.